→Can Happy Hormones Make a Slim Belly? Trying to win the Diet Battle? If you’re a woman 40-years-old or more, and fighting the dreaded battle of the bulge, you may feel like there is no hope. You’ve tried diet after diet without success. And you didn’t cheat, you followed them letter-perfect. 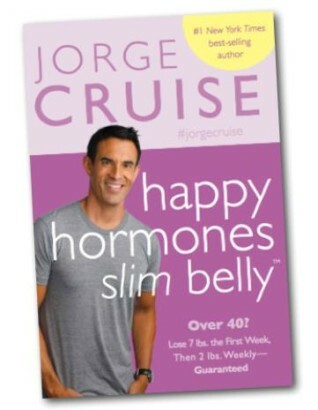 Well, according to Jorge Cruise in “Happy Hormones Slim Belly“, the problem maybe you’re being a little too stringent. If your body doesn’t get enough of the right kinds of foods, it sets up cravings that get more and more intense until you just can’t ignore them anymore. Despite advances in what women can do, in some ways it’s still a man’s world. Sorry guys, but facts are facts. For instance, let’s take diet research. Did you know men are the preferred subjects because they don’t have the hormonal flucuations a woman does, so that doesn’t have to be taken into account when figuring out the results? That is beginning to change, but it’s was the norm for many years. That’s all fine and dandy until the diet research done with men is applied to women. Hello??? Doesn’t it seem kind of obvious that if diet research isn’t done with women as subjects because their bodies are different, then the results women get with the diet the men used is going to be different as well? To complicate things even further, a woman can be affected differently by foods during different stages in her life. A woman’s body is regulated by hormones. Okay, so is a man’s, but there isn’t the same widely varying flucuations as a woman has. And when a woman is over 40 and begins to experience peri-menopause or menopause, those hormones are even more different. One of the effects of diet is on the levels of serotonin. You might call it the “happy hormone” as it’s needed for a sense of well-being. Low levels can cause mood swings and depression. Your body needs carbs to make serotonin. So if you diet so stringently there are no carbs in your diet, you might develop cravings because your body wants and needs those carbs to feel good again! This healthy food diet plan promises to allow a woman over 40 to diet and lose weight without the problems caused by too low carbs. This is accomplished by carb cycling, with 2 “slim” days of very low carbs, and 5 “happy” days that allow more carbs and higher serotonin production. To read a longer review of this book which expands on what’s in it, the good about it and the not so good, read my review on Happy Hormones Slim Belly HERE. Wondering if there is a diet that REALLY works for women over 40? If you've tried other diets and failed, it may be your hormones are the problem.